Are you minutes away from Millions? Millionaire GO! is our exclusive lotto betting game, with a fresh draw on the hour, every hour, every day. Millionaire GO! has a 5+2 game format just like Europe’s biggest lottery, and whatever the jackpot is, we’ll match it! Best of all, if you don't match a single number, you'll get your money back. What's not to love? On the hour, every hour – so why wait? With Millionaire GO! we always match Europe’s biggest lottery jackpot, but with one massive advantage: there’s a brand-new draw on the hour, every hour! So why wait? Bet now, or whenever you want, for the same top prize. Didn’t match any numbers? Get your money back! The chances of winning on Millionaire GO! are truly fantastic – if you don’t match a single number, you get your money back! That means almost half of all bets will win a prize. ALMOST HALF! 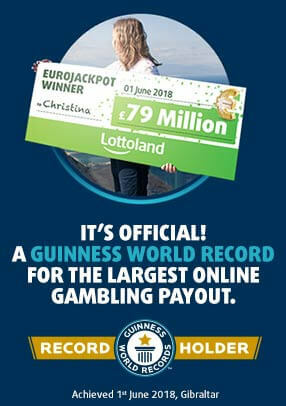 This massive game changer is exclusive to Lottoland and we’ve never seen anything like it ever before! Same huge jackpots? You’ve got it! With Millionaire GO!, our ground-breaking and fully licensed virtual draw technology enables us to always match the jackpot value of Europe’s biggest lottery. No matter how big the prize is, we can GUARANTEE we'll pay out your winnings: not just once or twice a week, but every hour of every day. That gives you an incredible 168 chances EVERY WEEK to win a jumbo jackpot! With its familiar game format, it couldn’t be simpler to bet on Millionaire GO!. Just pick five numbers from 1 to 50 and an two extra numbers from 1 to 12, then place your bet.